If thunder is Mother Nature’s percussion instruments, then lightning is certainly Nature’s fireworks. How is lightning formed? 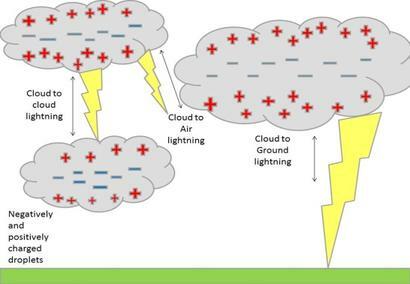 Lightning happens when negative electrical charges build up in the bottom portion of a rain cloud. At the same time, objects on the ground have a positive charge. When the negatively charged molecules in the clouds get close to the ground, a positive surge from the ground comes up to meet it. When the two meet, the result is lightning. When does Lightning happen? Lightning happens every day. 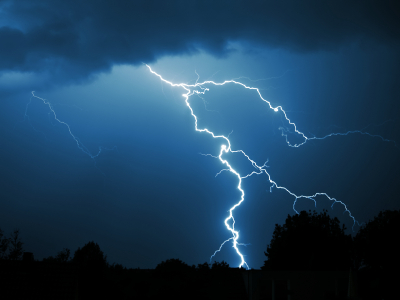 Over 100 lightning strikes occur somewhere on the Earth every second. Each lightning strike can contain up to one billion volts of electricity. Wow! Lightning heats up the air around it. The air expands and vibrates, making thunder. Lightning is very dangerous. Every year, it kills about 2,000 people worldwide. Lightning storms are common in the mountains. 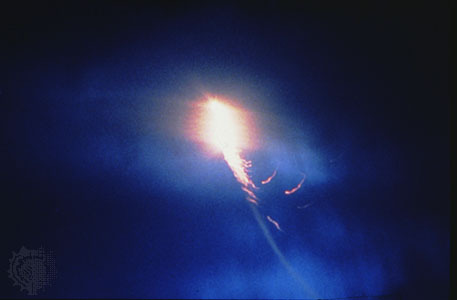 Ball lightning happens when a ball of lightning floats through the air. Scientists don’t know why this occurs. Question: What should I do in a lightning storm? Answer: Get to lower ground as quickly as possible if you’re on a mountain. Go to a large building or shelter. Even your car offers some protection. In a forest, get down under a grove of small trees. In an open area, go to a ravine or valley. If you feel your hair standing on end, lightning is about to strike. Duck down on the balls of your feet. Cover your ears and tuck your head between your elbows. Enjoyed the Natural Science for Kids Website all about Lightning info? Take the FREE & fun all about Lightning quiz and download FREE Lightning worksheet for kids. For lengthy info click here. Declan, Tobin. " Fun Lightening Facts for Kids ." Easy Science for Kids, Apr 2019. Web. 26 Apr 2019. < https://easyscienceforkids.com/all-about-lightning/ >.